My name is Stephen Davies, I am 47 years old and for my sins, I manage the Eyeworks practice in Walton-on-Thames. 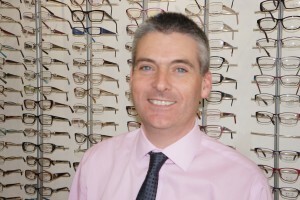 As the longest serving professional member of staff, I have been responsible for the fitting of spectacles here for some 29 years and I have literally grown up with the practice and the practice with me. I have fostered with my staff and clients alike, a very relaxed and happy atmosphere where laughter is audible throughout the day and earned a reputation for consistency and accuracy in my work. I have always been given the professional freedom to offer the very best in spectacle lens design where required, and despite all the cut-price offers on the High Street, continue to supply well sourced and high quality fashion frames which I personally choose for our stock of some 650 frames. Having grown up and been educated in the area, I am well placed to meet the varied and individual needs of my clients and I make it my business to get to know them – their lifestyle, interests, family and this helps me to choose the right pair of specs for them. Most of my established clients really trust me to choose the best and most affordable pair for them amongst the huge choice we display, and this only comes about by getting to know them and using my professional knowledge and experience to perfect the comfort and clarity of vision in their specs. Behind the scenes, I also enjoy personally making the specs which involves cutting the lenses to my exact measurements into the chosen frame. This is achieved by a very high tech glazing machine that scans the frame in order to obtain that perfect shape and fit. I then manipulate the fit of the frame by adjusting the sides and head width to my recorded facial and frame measurements. The result is a good - looking pair of spectacles and a happy client! My speciality here is the correct fitting of varifocals which allow a continuous range of clear vision from far to near (and everything else in between!) . As a practice we mainly recommend the Varilux brand as they offer advanced technology in their design at an affordable cost and we have been accredited as a GOLD and SPECIALIST ACCOUNT. I often talk to clients who have had bad experiences in the past and are reluctant to try them again. New technology (really in the last few years) has meant that distortion and that swimming feeling is significantly less than on older and cheaper designs. I have many clients whose lives have been transformed by the convenience of one pair that does everything but allow them to read in bed! And make a cup of tea in the morning! Special attention too is given to the importance of well - fitted children’s spectacles. So often, I see children looking over the top of poorly fitted frames thus doing very little to improve their vision. Here at Eyeworks, we are all registered with the General Optical Council and Association of British Dispensing Opticians which is a legal requirement for the fitting of children’s specs and that of the partially sighted. I look after many children from the Hospital Eye Service who appreciate the proper attention to the fit of their spectacles and the convenience of calling back for re fitting when kids will be kids! As you have read, Optics is a real passion of mine. It’s in the blood. My grandfather and uncle gave my brothers and I (also opticians) an early insight into the world of optics. My uncle had a small chain of practices dotted around the country and his flagship store, which was in Knightsbridge, was a real adventure for a young Surrey boy and very sophisticated and glamorous too! He also had a basement workshop in his Ealing practice that was at the end of the Circle and District Lines where I could watch the tube trains coming to a halt at the buffers about two metres from the basement window. This gave me the opportunity to pull funny faces at the tube drivers. Kids hey! They never change! The industry has changed so much since the 1970s (and so have I thankfully). Now practices are known as Retail Stores and are much more customer friendly .Deregulation in the 1980s has meant that standards vary enormously so you need to choose your optician wisely and preferably on recommendation. We have recently undergone a practice refit that reflects optics in the onesies! (sorry, but I couldn’t help it). The layout is much cleaner and you can browse at our stock before booking your eye examination without feeling pressured. Help is there only if YOU want it. Gone are the days of the dreaded NHS specs that gave uniformity not individuality. Plasters holding them together are a thing of the past. When I first qualified glass lenses were the norm making specs heavy and uncomfortable. Now there are so many lens options with refinements to enhance vision and protect your eyes from glare, sunlight (and thus UV) and blue-light emitted from computer screens, i-phones and many other LED appliances. If you would like to experience good old-fashioned skills with up to date technology and products, then I would be happy to welcome you to Eyeworks which tailors its’ service to you as an individual. And if we don’t get it right first time, we put in right without any fuss or bother. We are privately owned and independent, and as you can see we enjoy what we do. I hope you have enjoyed my jottings and that I will be given the opportunity to write again.